Kids are people too! Growing kids need a lot of attention. Supplements and vitamins, milk and everything else to keep them healthy. 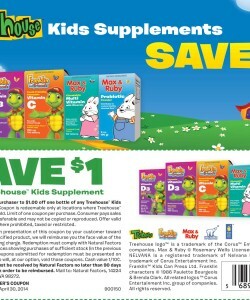 You can do that when you use this TREEHOUSE KIDS SUPPLEMENTS DISCOUNT COUPON. Supplements are great ways to keep your kids on track with their health regimen. Treehouse offers a variety of supplements – Vitamin D3, Vitamin C, Multi-vitamins, Probiotics and more. Save $1 off one bottle of your choice. Supplements can get very expensive, so having money off definitely will help your overall goal of making sure your kids have their nutritional values intact while still saving money. Believe it or not, supplements can make a huge difference, especially if your child is very active or is not a healthy eater. Supplements add nutrients that are lost, giving your child the best protection against infections and diseases. This is one of the best ways to provide safety with the kids not knowing what’s going on. Children don’t like taking “healthy” stuff unless it tastes good. Treehouse is a kid friendly brand that will have your child asking is it time for the treats. This is a quick and easy way of taking care of business. With the theme being centered around cute characters of rabbits and friendly frogs, you can’t go wrong. Take the time to do your research and see what they have to offer. It will be a huge burden lifted off of you and your kids will continue to have healthy development. It’s a great process that will be sure to garner you spectacular results. If you can’t beat ‘em, join ‘em! 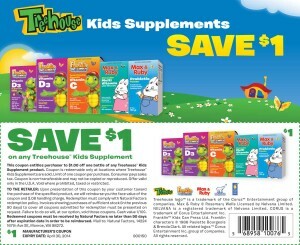 Save $1 off one bottle of any Treehouse Kids Supplement product. Redemption must comply with Natural Factors redemption policy.